It is difficult to obtain an accurate ranking of the most important toxins responsible for human poisoning in South Africa from the study data available, because there are so many study variables e.g. hospital admissions vs. post-mortem cases, medical (accidental) vs. forensic (suicide or homicide), paediatric vs. adult, urban vs. rural, clinical diagnosis vs. toxicological analysis). PARAFFIN - the number one cause of poisoning in South African children, and a major fire hazard. Paraffin is widely used as fuel for cooking, lighting and heating in poorer communities. It is often sold or stored in unmarked containers e.g. old cooldrink bottles. It is usually accidentally ingested in only small amounts, but up to 40% of subjects develop a chemical pneumonitis due to aspiration of this low viscosity liquid hydrocarbon. Respiratory signs (Tachypnoea, dyspnoea, cough) develop within 0.5 - 8 hours; some develop signs of bronchospasm and there is cyanosis in severe cases. Fever is common but fever after 24 - 48 hours indicates secondary infection. X ray changes are seen early on: patchy infiltrates, initially perihilar, progress to large areas of consolidation. Treatment is supportive: oxygen, assisted ventilation and antibiotics, as indicated. The patient was a 57 year old woman who had amyotrophic lateral sclerosis (motor neurone disease). The generalised muscle weakness and wasting had progressed over a period of four years and respiratory difficulty from chest muscle and diaphragm involvement had become a feature during the last six months of her life. She also had severe constipation which she treated by taking liquid paraffin (medicinal paraffin) daily. At post mortem both lungs were heavy. 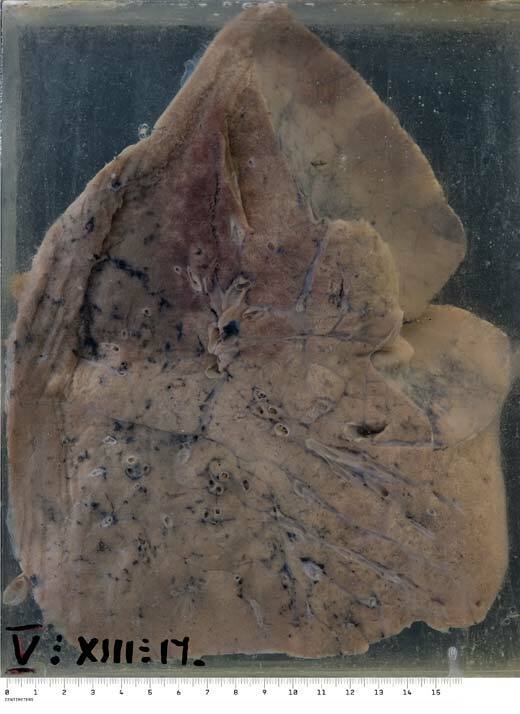 This is the right lung which weighed 927 grams. The middle and lower lobes are pale and solid. This appearance is present in the inferoposterior regions of the upper lobe as well. On microscopy large amounts of lipid both free and in foamy histiocytes was seen in the lung parenchyma. There was very little inflammatory reaction. The diagnosis is exogenous lipid pneumonia from inhalation of liquid paraffin. Seen more commonly in clinical practice is endogenous lipid pneumonia, in which bronchial obstruction (by carcinoma, for example) leads to stasis of secretions/ fatty cellular breakdown products.